In this post I look at contracts closed in April 2011 in zip code 20814 using data released by MRIS. You'll find Bethesda and NIH in this zip code. And since the Apple store is located in 20814 on Bethesda Avenue, it's the nexus of the universe. Compared to the same month in 2010, aggregate dollar volume was up 20.86%. Although unit sales fell 16.67%, the average sales price rose 45.03%; the median sales price was 2.62% lower. The average price for a condo fell 20.67%. The average price for a house was 37.25% higher, probably thanks to the fact that 6 of 20 houses sold for more than $1MM. The 10 condos sold for prices between $150-600K, the 20 houses sold in the range $300K-5MM. Unit sales for condos were down 50%, but up 25% for houses. The number of homes listed, 114, was about the same as April 2010. 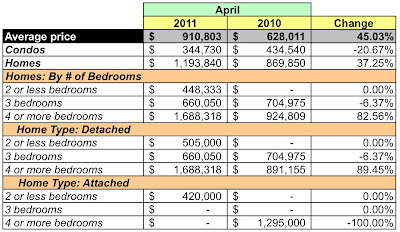 At April's sales rate there's a 5.9 months supply of condos and 2.75 months for houses. About half of the condos listed in 20814 are in the $150-300K price range. More than half of the houses were listed at prices exceeding $1MM. According to MRIS, properties in 20814 sold for 93.8% of the listing price. 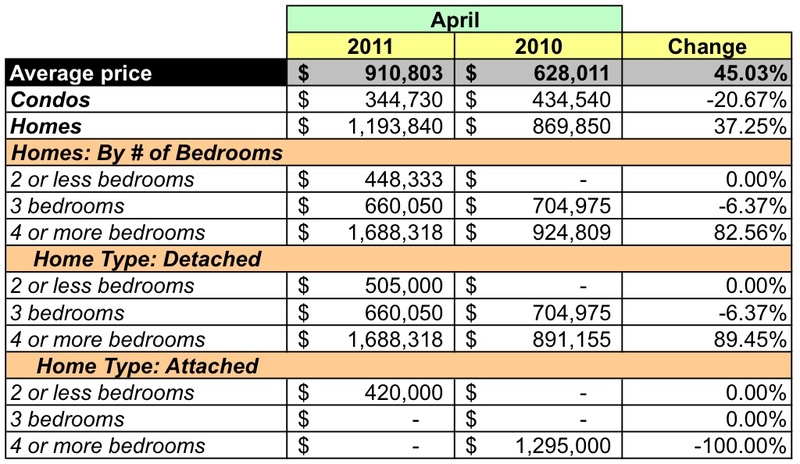 Based on sales in 20814 for each of the past 11 months [excluding April 2011], the average sales price for a condo was $370,951, for a house it was $934,459. Given its relatively low entry prices, zip code 20814 should be an attractive area for those who're looking for a condo. With an inventory of almost 6 months, the condo market is close to equilibrium. The market's much more tilted towards those selling houses and with an average price greater than $900K, it will be a bigger lift for buyers.